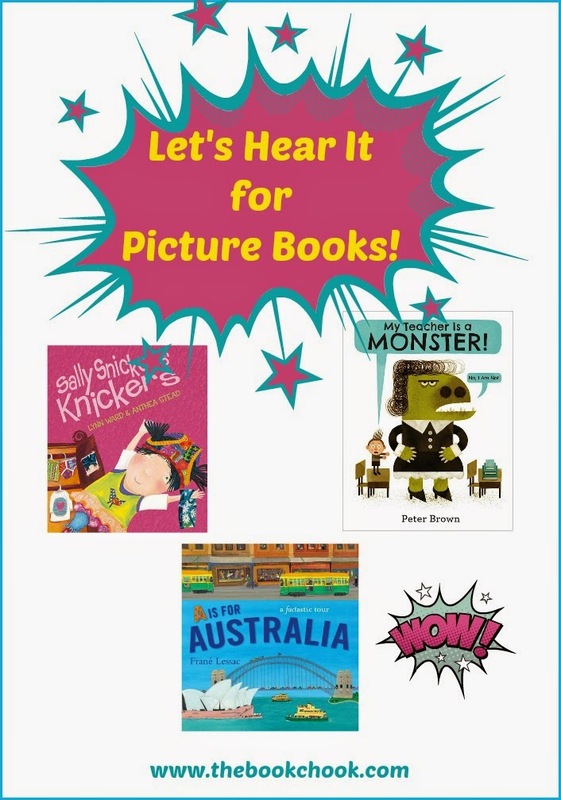 The Book Chook: Let’s Hear It for Picture Books! Let’s Hear It for Picture Books! Do you have a special, loved children's picture book you remember really well? I told you about some of my recent favourites in Top Children’s Picture Books Reviewed 2014, and even made myself choose my Ten Top Picture Books. Have you ever stopped and reflected on how versatile picture books are? We can share a picture book with a baby, read it aloud often while he’s a toddler, then rejoice when he “reads” it to us after memorising it. Later, it’s enormous fun to ask kids 10+ about their favourite picture books from when they were young, and see their faces light up. Have them read those books aloud to each other, or to younger kids, and you’ll see a special loving glow in their eyes. If you’re a teacher, you can find picture books to help you teach any subject at school. Picture books are a first port of call if you know kids with problems - often you can find a character with a similar problem inside a picture book. Teachers rely on picture books to model special kinds of text, and they also provide opportunities for debate, discussion and even argument. Students begin to develop visual literacy skills even before school because of the variety of visual materials in children's picture books. By making predictions and inferences based on both text and images, kids add to their comprehension skills too. And picture books also come to the fore when we’re teaching genres like fairy tales and folktales. As both writer and teacher of writing, I love what picture books model to young writers. Within their pages, kids can discover much about the craft of writing - from different kinds of sentences, through to hooks and extended metaphors. Deconstructing and reconstructing text helps them not only to understand a text, but delve deeply into its craft and structure. Having a picture book author come and discuss her own writing process is also a boon to kids. Picture book writers are masters of writing tightly, and are able to show how they have pruned early drafts of “fluff” words. They can help children understand how important word choice is, and discuss characters, plot and setting for a particular book. I share picture books on a weekly basis with that most critical of audiences - a group of pre-schoolers. Woe betide the picture book that doesn’t grab their interest! I’m treated to itching, wriggling, squirming, and roof-gazing. Over the months I’ve begun to learn what will appeal and not appeal to this group. To make matters more difficult, the composition of my group can completely change from week to week. One week there are lots of four-year-olds; the next we have lots of babies and toddlers; the next the crowd swells with new children, some of whom aren’t accustomed to a library or Storytime. So… I’ve learnt to have a plan B, with extra books and rhymes, and to pick up on the wriggles before they escalate. I’ve also learnt to choose books that are active, fun, often with strong rhyme and rhythm, dynamic illustrations and simplicity. Babies and toddlers have short attention spans, so short and simple is good. I don’t mean dumbed down! Just generally not a complicated storyline. I stress that this is with a group. If I were reading to one child, my criteria would be different. Picture books are some of the first books we read as young children, and our love for them truly doesn’t fade. Thank you, picture book authors, illustrators, designers and publishers. Without you, our lives would be poorer. Come on, picture book appreciators, let’s hear it for picture books!